Josh Eichhörn: spent a lot of time out in California, with various sycophants dripping their poison in his ear. At the Rock House Diner, Malcolm Dragon enjoys a meal with his girlfriend Maxine Jung Lai. The young couple are unaware that they are being watched by two of the second generation of Vicious Circle members. Waylon Wipple manages to upset his girlfriend by saying complimentary things about Maxine. He then tries to do some damage control to limited successwith Inferno Girl before they opt to leave so that they can discuss the impending breakout of Cutthroat Kid from juvenile hall. In the hidden lair of the Claw, an army of automated monsters are being grown in the laboratory of the resurrected villain. He has dismissed the Vicious Circle as being weak and so has opted to grow his own invincible army. Thunder-Head questions the wisdom of his new master trying to take over the world. His previous attempts decades ago resulted in his death and Thunder-Head does not understand why the Claw wishes to make the same mistakes. He is struck down for being insolent and cowers in fear from the villain. Sam Haze goes to Stronghold Penitentiary where he interviews Dragon about his current situation. Dragon does not understand why he was convicted of Emperor Kurr’s crimes as he is innocent of any wrongdoing. He talks about how Darklord would not have allowed any trace of his former personality to remain when he was brought back to life. 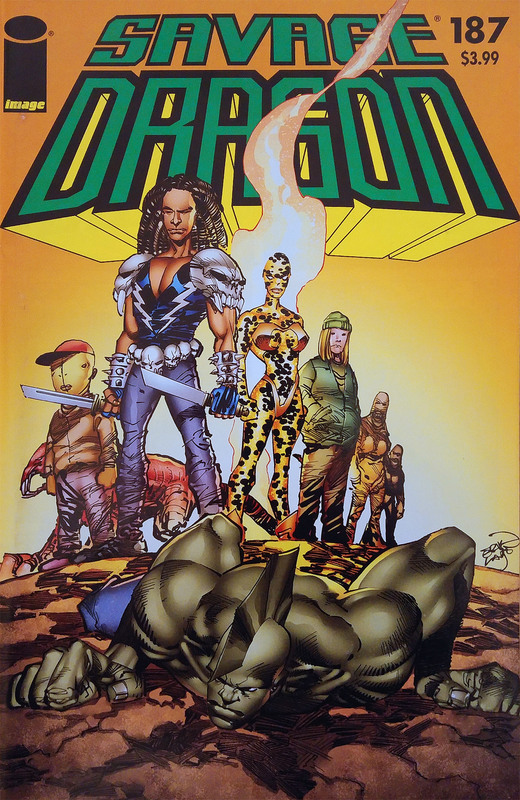 Sam talks about how the Church of Savage Dragon are praying for his fate and that others, such as himself, owes Dragon for helping turn his life around. Dragon vows that he will not give up on clearing his name and avoiding a death sentence. Dung’s wife has finally had enough of being married to a supervillain. She is leaving the aging career criminal as their lives have not improved in all the years that they have been together. The fact that they could not have children of their own also causes her distress and that Blossom and Dumpling are not adequate alternates to real children. Blossom has no idea that she was not a real girl so Dumpling does her best to comfort her sister. At a building owned by the Vicious Circle, PowerHouse and Flash Mercury are summoned to meet with their new leader. FirePower has seized control of the criminal organization and he declares the two new arrivals that their presence will no longer be tolerated in Chicago due to their differing opinions regarding freak politics. FirePower threatens the pair with the wrath of the Vicious Circle unless they depart in 24 hours. In a freak bar, Mako gets riled up when Frogman mocks his previous attempts to eliminate Dragon on more than one occasion. He ends up fighting with several of his fellow Vicious Circle members before heading out into Chicago on a rampage. Red Giant attempts to strike Mako down but she is punched onto a building that houses several super-freaks. They seek revenge upon her and Star. Malcolm comes to his friends’ side to fend off the freaks. PowerHouse and Flash notice the rampage unfolding and decide to do one last deed before they leave town. They weaken Mako but are themselves defeated, leaving Malcolm to finish him off for the cops. Waylon Wipple heads out to meet up with Octopus Jr. so that they can join up with the rest of their friends to liberate Cutthroat Kid. They blast open juvenile hall where their colleague is waiting for them. As the group flee the scene, Captain Stewart calls in Malcolm to assist with the situation. The youngster races to catch up with the young villains where he quickly crushes the weapon that had been created from the OverLord armor. Malcolm then punches Waylon unconscious before he quickly defeats the entire group of teenaged criminals. Rock and Widow assist the authorities as they investigate the death of Absorbing Junior and the sudden disappearance of Zeek. They explain the circumstances behind both events but declare that they have no idea where their friend has vanished off to. Zeek finds himself in a mountainous landscape, confronted by a being that bears a striking resemblance to him. Atlas introduces himself and explains that he is Zeek’s ancestor. He came to Earth following the death of Zeus as part of the AllGod entity, hoping to assist his fellow Gods here rebuild their home in God Town. Atlas demands that his descendant accompany him back to God Town to help with the aftermath of the recent alien invasion. Zeek reacts by punching his abductor a great distance across the landscape. He then realizes that without Atlas that he has no way of returning home to Chicago and sets off after his enemy. As Zeek makes his way toward Atlas, he notices a shadow closing in on him as Atlas leaps back into action. He was incredibly impressed by the force of Zeek’s blow and looks forward to further testing his young relative. The ancient God proceeds to brutally assault Zeek until he is struck in the centre of his chest, caving in Atlas’s chest plate and cutting off his air supply. 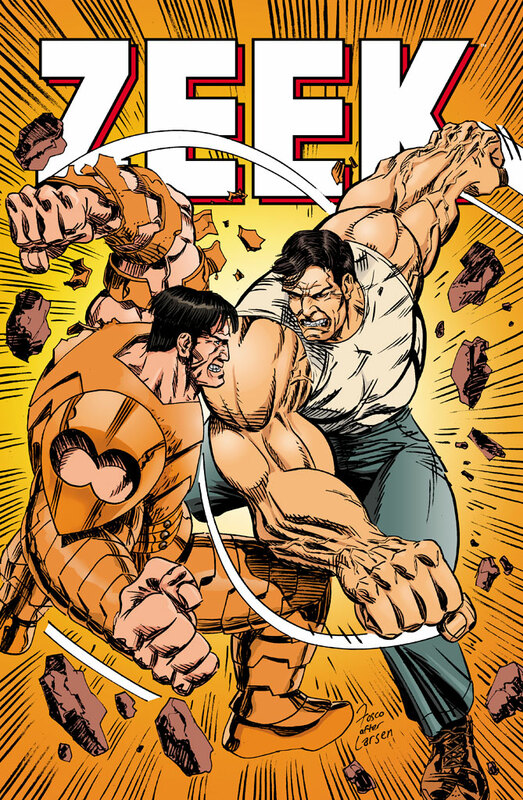 Zeek offers his assistance by tearing the chest plate off of his foe before pummelling Atlas into the ground. Atlas emerges from the rubble and requests a truce, acknowledging that Zeek is his physical superior. He then pleads with Zeek to help his fellow Gods. When he promises the simple-minded behemoth that he can still eat burgers in his new home then Zeek agrees to go with him. The two mighty warriors then set off to walk down to God Town.